A very big thank you to everyone who contributed to this years Rattery Garden Show and Sports 71st year. Especially to all the committee and volunteers who gave of their time and hard work preceding, during or after the event. Also a special thanks to our new helpers who helped tired stall holders to have a break during their busy day. Great to see new faces helping with erecting and dismantling the marquee. Namely Nick, Robert Hatt, Robert and Martin Carol, Mike and Heather with our seasoned team of Bill and Val and Richard. Equally grateful to all regular helpers plus Phil Barrington, Robert and Martin on Thursday evening setting out the sports track etc. Thanks to Peter Smerdon for supplying wooden stakes for spectator/ athlete zones and mowing grass for the track events and stall holders. Many thanks to Anthony Coaker for driving the tractor with post driver attachment and family for placing stakes with Colin who also removed them at show end. 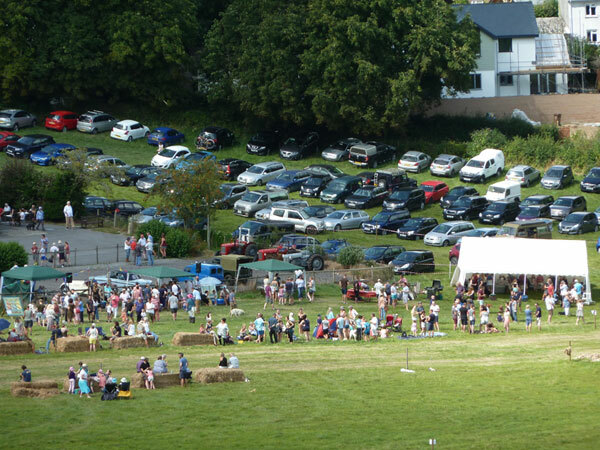 Also a big thank you to Peter Smerdon for supplying straw bales and setting out the cross country race. To Anthony Coaker for the Obstacle race and all involved with Setting up stalls, bbq’s , bar, hall exhibits, gazebo’s, bunting, signage, cordage, litter bins and countless other jobs done by our great team of volunteers. The Hall was managed superbly as always by Richard Haigh and Alison Samuels who arranged with their stewards all the exhibits for the many classes which were up on any previous year. A big thank you to Angela Smerdon and her team for all the refreshments available throughout the day. Also our judges and their stewards who spend several hours debating and categorising the many exhibits and awarding the relevant prizes to successful entrants. Thank you to our five new judges namely Margaret Macbean, Margaret Burdge – domestic classes, Mr Pook for flowers, Vicki Archer for art and handicrafts and Steph Bradley for the children’s section. Also our regular judges Brian Griffiths and Jo for produce, Vicki Pearce for flower arrangements. We trust that they are available for judging for us next year. In the reserve car park, we thank Jim Thompson for bringing three classic cars and to Gordon Raymont and team for bringing three vintage tractors and a land rover. The Marquee was stationed in the sports field this year and worked very well there. A big thank you to Will and his team for supplying beers, ciders, wines and soft drinks all day and donating kegs of alcohol as well as prizes for the dog races. Adjoining the marquee, the lamb roast was run and supplied by Mark and Deborah Daymen and family which was eaten to the last morsel along with pork sausages. The stalls run by Linda – face painting, Jan and Alan – Ice Creams with help from Kelly, Raffle - Joy, Rachel and Tony, Coconut Shy- Don and Craig, Crock Smash - Bill and Phil and Robert, Welly Wanging - Miles and Ben, Hoopla – Heather and Ben. Thanks guys and gals for all your hard work in the relentless heat. Ian Samuels and Anthony Coaker and Peter Smerdon as race officials and commentator Ken Creber managing the PA System. Also, to Peter for organising the parade of vintage vehicles. Not forgetting the gate and car parking ably managed by John, Phillip and Mike. Thank you to our Treasurers Lin and Buz for all their hard work in managing the shows financial affairs on the day and beyond. Thank you to Mark and Deborah, Mark and Janet Causey and Tom Foreward for use of their fields to run our show and to all those who kindly donated prizes and donations. A sad note to the proceedings was announced on opening the show. The loss of Alan Gautry to whom we dedicated this years show. Alan was a stalwart helper with our show and in many aspects of the village hall. In his memory a park bench with an inscription donated by the hall and show committees has been placed outside the hall entrance. This was unveiled by Kay his wife and daughter Kelly. Further news reached us that Ken Bovey who has exhibited in our show for more than sixty years since aged seven had a nasty fall which resulted in a broken hip, friends helped display his entries and Ken won again with his excellent vegetables. Chrissy Sparkes who was unable to steward in the handicrafts this year due to illness did grace us with her presence for an hour or so. We wish these and others with afflictions and loss our very best wishes. A special thank you to Bill, Val, Richard, Alison and Peter for getting me through my first year as chairperson. The last big thanks go to our own villagers and visitors from far and wide and also those holidaying here. Your support and enthusiasm in taking part makes our efforts worthwhile. Local Child, 4 - 7 yr.